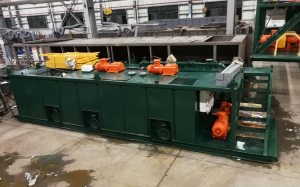 Mud tank system is combined with mud recycling and mud mixing application for drilling site drilling mud process. AIPU delivery a 3 tanks system to worksite last week with shale shaker, mud cleaner, mud agitators and mud mixer to reach mud circulation on drilling site. The 3 mud tank will be lay in a line with mud storage capacity 100 cubic meters including dirty mud capacity and clean mud capacity. Each tank make all tank connections and clean gate within tank skid to maximum tank storage capacity at a maximum tank size. 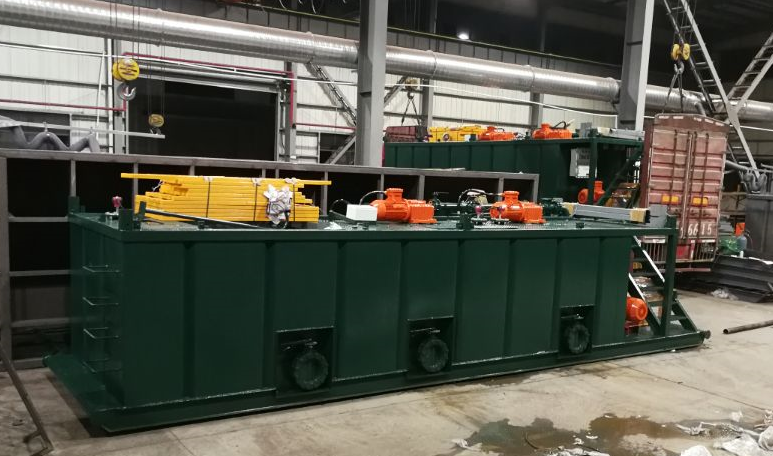 2 sets linear motion shale shaker with max mud flow capacity 800GPM at 40 mesh shaker screen installed. 1 set of poor boy degasser stand beside shaker tank with all necessary pipeline connected to shale shaker distribution pipeline. 1 set mud cleaner with linear motion, desander cyclone and desilter cyclone for cut point 15-25 micron. 2 sets centrifugal pump to feed mud into desander and desilter with pressure 0.25 to 0.4 Mpa. 3 sets mud tank with all necessary pipeline, valve, walk way, handrail, etc. Mud agitators installed on mud tank to avoid solids build up at tank corner. 2 sets mixing pump with a mud mixing hopper to mix new chemicals into drilling mud. AIPU is able to build different sizes mud tank system with different mud flow capacity, tank storage capacity, cut point, tank layout type, pipeline arrangement, etc. Please contact us freely for mud tank inquiry.